The Manual Mobile Skid Tilter (MMST) is an ergonomic work-positioning unit operated entirely by hand. 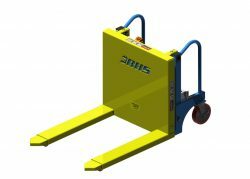 Users wheel the MMST into place, secure the brake, and lift and tilt loads on skids or, with the Straddle-design model, pallets and pallet bins. By tilting bulk containers toward the worker, Skid Tilters prevent a wide variety of musculoskeletal disorders associated with bending at the waist, reaching, and repetitive motions. Manual Mobile Skid Tilters include powder-coated steel forks and honed hydraulic cylinders with hardened chrome pistons, all mounted to a welded-steel frame These features greatly expand the MMST’s load capacity over competing equipment; depending on the model, the MMST is safe for tilting loads of up to 4,000 pounds. Premium phenolic casters and a pair of ergonomic push handles simplify travel, which does not require forklifts or other material handling equipment. This makes the Manual Mobile Skid Tilter ideal for applications that don’t allow lift trucks, such as food production and some medical settings. Call BHS at +1 314 423 2075 to learn more about work-positioning equipment such as the Manual Mobile Skid Tilter.